Around the world, women make up roughly 61 percent of the labor market and are attaining college-level degrees at a faster rate than their male counterparts. Yet women only account for about 18 percent of top leadership positions in the United States despite the fact that almost 90 percent of the general public consistently report being comfortable having women in such roles. This disparity is particularly troublesome considering that recent studies suggest women often outperform their male counterparts in top-level jobs. Public companies with female board members, for example, perform significantly better than those that don’t have women on their boards. These studies suggest that any organization that cares about profits and performance would be well-served to include more women at the top. So what hinders women from climbing higher up the leadership ladder? Underrepresentation of women in top leadership roles is not necessarily because of blatant exclusionary or discriminatory practices. Rather it is more a result of subtle, invisible barriers and cultural beliefs around gender, as well as workplace structures and patterns of interaction that inadvertently favor men. More opportunities are available than ever before for women to pursue the leadership roles they want. For too many years, our messages to women–whether through advertising, mentorship, books, or speaking–have been: follow the rules, keep your head down, don’t take risks, and be demure and poised at all times in order to succeed. For example, although men in leadership roles are admired for being strong and assertive, women who exhibit the same attributes are sometimes judged as too aggressive and, therefore, unlikable. 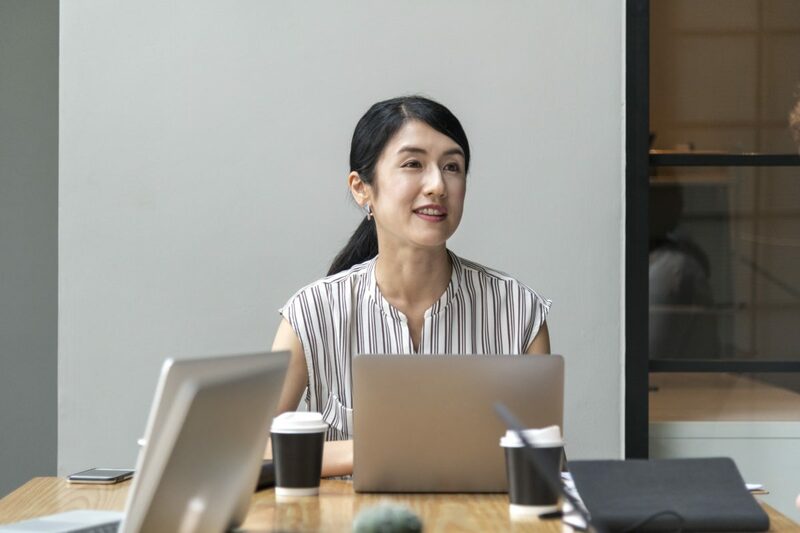 For many women poised for leadership, the experience of being turned down for a promotion or watching a younger or inexperienced male colleague move into a higher position can be a devastating blow to one’s internal bravery and self-confidence. Part of the solution to overcoming these structural biases and self-defeating perspectives is through the intentional application of courage. Courage, fortunately, is a teachable and learnable skill. Although having courage is critical to all aspiring leaders, it is particularly important for women. Women who are successful in achieving their career goals do so because they are willing to take chances when opportunity knocks, even if success is not guaranteed. Having try courage means taking the initiative to do something new despite the natural hesitancy that fear may produce. Courage means to act despite being afraid. Trust takes courage, especially if you’ve been betrayed in the past. And who hasn’t? But trust is essential for forming strong bonds between leaders and followers. Without trust, relationships cannot progress. Trusting others is particularly challenging for women who fall prey to the “superwoman” myth, believing they have to “do it all” to be successful. Given that four out of 10 women in the U.S. workforce are their household’s primary breadwinners, the number of women under the spell of this myth is likely significant. Superwomen aren’t the only people who may have difficulty trusting others. People who are controlling by nature, such as perfectionists, also struggle with trust. to be controlled by other people.” Guess what? No hands go up. People like to be in control, but they don’t like to be controlled. Having trust courage requires letting go of the need to control or to always be right. It means being vulnerable and open despite knowing that you could be betrayed and hurt. Speaking up, sharing your ideas, asking questions, and delivering constructive feedback all require courage. Tell courage requires being a truth-teller. It’s important for women to speak up when they identify policies or workplace practices that exclude women or cause them to be overlooked. Most organizations are made up of good people who are not always aware of how their policies or company culture contribute to bias. Inflexible work scheduling practices, for example, often make it difficult for working mothers to succeed and advance. Applying tell courage can help instigate positive change. Women sometimes find speaking with conviction challenging. They will hedge their statements with opening remarks such as, “I might be wrong but …” or “I don’t know, but it seems to me that ….” Such self-dismissing statements transmit a lack of confidence on the part of the leader. If you don’t stand up for your ideas, no one else will either. For that reason, building tell courage is critical to the aspiring women leader. Too many people react defensively to constructive feedback, as if their identity were under assault. Take-in courage involves being able to listen to feedback without feeling threatened or punished. Surprisingly, even positive feedback often is resisted, particularly by women. For example, we notice that some women dismiss positive feedback by saying things such as “It really wasn’t a big deal” or “Anyone could have done it.” Getting feedback from others may be uncomfortable, but it’s essential to growth and development. Olympic athletes such as Gabby Douglas or Hope Solo may not have always been happy with the specific feedback they received from their coaches and trainers, but without it they wouldn’t be gold medal winners. Excellence is a function of making small changes based on constant feedback. Thus, having take-in courage can advance your career. How do you find or increase the courage within you? Here are six characteristics of brave women in leadership roles. They don’t wait for bravery. Everyone has fear inside of them. It’s what you do with that fear that separates you from the pack. Fear can often paralyze us for years or even decades, and we stagnate in our growth. To achieve your goals, you don’t have to magically flip a switch to find your bravery. You simply need to to prioritize your dreams over your fears. By keeping your dream or big goal in focus and pushing down fear, bravery will naturally rise to the occasion to help you take your steps to achieve the goal in front of you. They don’t mind “sticking out” from the crowd. Courageous leaders aren’t afraid to appear as a “black sheep,” or to choose the road less traveled. Doors open when you close others. That means you’ll need to say ‘no’ to opportunities that don’t feel 100% aligned with your goals. The more you say no and draw boundaries while pursuing the path that is right for you, the braver you’ll feel with each passing day. They quiet their minds. In order to take the right risk, courageous women know they must learn to “be still.” Whether through meditation, walking, sitting in a closet like Oprah Winfrey, or simply “breathe in confidence, exhale doubt,” you can find what works for you to draw boundaries and center your mind and body to make the best decision for your next step. They love a reality check. Courageous women ask themselves, “What’s the worst that could happen?” They take the time to write down these worst-case scenarios. When you get it out of your head and onto paper, the physical act of writing down the reality of a potential choice and its outcomes can turn out to be…not as scary as you thought. Instead of reliving dramatic stories in our heads that haven’t even happened yet, get them out and dispel fears. They are proactive in supporting and paving the way for others. Courageous women don’t just accept the red carpet or cleared path…they roll it out or bushwhack it for the next group of women. By taking what you’ve learned through your experience and sharing it with others, teaching, mentoring, or simply opening the door, you help to strengthen your core purpose because you see your journey reflected in others. They don’t let fear drive the car. Courageous leaders know how to move forward with their fear, rather than allowing their fear to become a complete dead-end roadblock on their journey.